In the sacred lands of Wipuk (Sedona) massive red sandstone spires stand elegant and imposing. Wisps of green sweep around the base of these rocks, a thread of verdancy drawn by the waters of Oak Creek. Each massive rock formation has its tale. Legends have accumulated, passed from the stories of the tribal original inhabitants and received by the contemporary residents, amalgamated into content and message that meets the needs of each succeeding generation. There once were a man and woman, husband and wife, who loved each other deeply, and yet they were continuously arguing and bickering. She was displeased with his behavior, as he was resentful of her demanding nature. Their yelling and shouted accusations caused a commotion in the peaceful land. This tumult was enough to awaken Paluluken, the Great Horned/Feathered Serpent, from his slumber. Paluluken lifted his mighty head and spoke to the couple, chastising them for their misbehavior and selfishness. He then directed them to stop fighting and to take the time to look around and enjoy the beauty of the world. This the man and woman did, and found themselves filled with a deep appreciation of the land and of each other. They were able to recognize the other’s beauty, and so came to be in harmony with the land about them once again. As a reminder of the necessity of respect between Man and Woman, Paluluken turned them into the two towers known as the Lovers’ Rock, embodying the principle of harmonious reunification, eternally. Seen as a Man and a Woman standing back to back, they each hold a view of the world that is different, and in sharing that view, so compliment the view of the other. Each now has a greater perspective of life and the world than if they were to each stand alone, demanding that the other see the world from their own point of view. The myths and creation stories represent, in dramatic form, the dynamic interplay of the sacred dance between the planets, stars, Sun and Moon and Earth. Where there is a particularly impressive event, especially if it is repetitive over the course of time, the retelling of that cosmology, in story form, transmits the cumulative knowledge and guidance that has been derived by its witnesses through the ages. The story of Lovers’ Rock, and the towering rock formation of Cathedral Rock, serves as a codification of a very impressive sight in the evening sky that takes place. I am referring to the dance that Venus, Mars and the Crescent Moon perform for our viewing. Every 6.4 years (2338 days) Mars and Venus return to the same positions relative to our viewpoint from the Earth. The early Crescent Moon intersects Mars and Venus every month during the interplay. Venus, brilliant and demanding of attention, rises gloriously into the evening sky. Mars, coming from the East in its passage across the sky, meets up with Venus in the western sky. There, Venus rises to its highest station in the sky (about 46 degrees) and then begins to drop towards the western horizon, culminating its 260 day journey as the Evening Star. Mars, meanwhile, does a series of forward and backwards movements, rising higher, then dropping lower into the western sky, only to rise a few degrees again before it rapidly sinks below the western horizon. To the observer’s eye it appears that Mars and Venus are coming together, then pushing each other away, dancing back and forth in the evening’s dusk. The Moon, just a few days after its New Moon phase, is a slender crescent that passes through, each month for a few months, the specific area of the sky in which Mars and Venus are doing their dance. The dynamic dance of Mars and Venus are represented by the Man and Woman of the story, as well as the rock towers known as Lovers’ Rock within the Cathedral Rock formation of Sedona. The Crescent Moon is the cosmological expression of the Serpent, as the serpent represents the spiraling, sinuous movement of the Moon that is visible in its passage across our sky. Each night the Moon appears in a location to one side or the other of its previous night’s station. Over the course of the month the Moon is observed to have traversed, in its sinuous motion, a pathway that extend from north to south and back again across the horizon. The bright crescent shape of the Moon when it is low to the horizon provides it with the imagery of a horned, or feathered, serpent. In keeping with the dictum of ‘as above, so below’, it is the serpentine course of Oak Creek that gives the Great Horned/Feathered Serpent its physical expression here in the land of Wipuk. The relevance of gaining this insight into the mythic and cosmological components of the story associated with Lovers’ Rock is that this legend, as so many other tales told by Earth Peoples, conveys principles that – if we will but pay attention to their wisdom – will provide us with insight and guidance as to how we may live a better and more fulfilling life. A life lived in appreciation of the beauty around us, and of the beauty inherent within our mate and family members and in the affinity of our communities, stands as an ever-present reminder that harmony and peacefulness in our life is not something that happens to us, it is a choice we make. 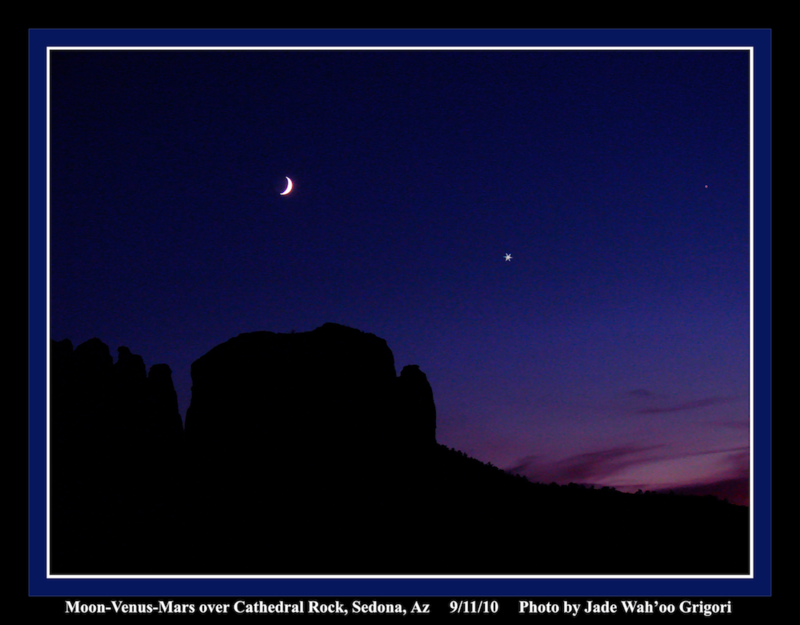 On Saturday evening, September 11, 2010, I went to Cathedral Rock and made my commune with Lovers’ Rock, and the attendant phenomenon of the conjunction of the Crescent Moon, Venus and Mars that was going on directly above the rock. Taking a series of photographs, I was able to bring home an excellent image of this sacred dance to which I was fortunate enough to participate. I here share this image with you, so that you can meditate upon it and establish your own commune with this archaic and empowering cosmological event. It is an experience that is just as available to you, today, as it was to the Ancients who transmitted the story, and teachings, of Lovers’ Rock to the many, many generations hence and yet to come. Please feel free to share this image and writing with your friends in any non-commercial manner. You may not abridge nor edit this material. Please include my contact info, above.